The FCA Jump Rope for Heart event is coming soon! The event will take place in P.E. classes on February 5th, 6th and 7th 2018. All students will participate in the Jump Rope for Heart event activities during P.E. class regardless if they have collected donations or not. Information about the event and the fundraising challenge went home last week in a packet. A fundraising envelope went home in your student’s packet. This can be used to collect donations. You can also set up a personal fundraising page on the website. Find Fort Caspar Academy and join our team. Send emails and ecards asking for donations. 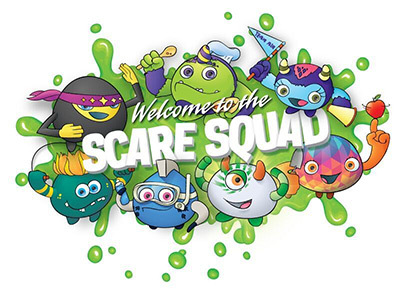 Earn Scare Squad characters with your donations! Collecting money is OPTIONAL – that is a decision between parents and their children. Students must have permission to collect donations. For the safety of our children, we ask that your children not go door-to-door or ask strangers for donations. Ask family and friends. Checks can be made payable to the American Heart Association. FCA will have the opportunity to earn free PE equipment based on FCA’s total AHA donations! FCA students have raised a lot of money for AHA over the years – even earning a recognition in 2011 for raising over $11,000! We are very proud of everyone who took part in these events. Questions?? Contact Mrs. Perri Shutts at the school or stop by the gym.